Having difficulties looking for Stauff pressure gauges ? We can help you because we have all sizes. Pressure Gauges are pressure measuring devices. There are used on equipment for monitoring and ensuring the smooth functioning and operating safety of systems. 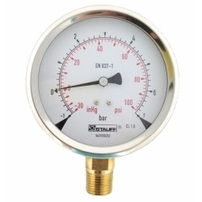 We carry Stauff Pressure Gauges with various connection ports to fit many different installation and pressure requirements. 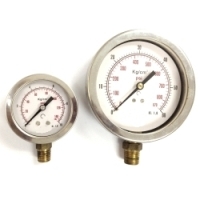 Size Range: 63MM and 100MM / 2 1/2" and 4"
We now have online shopping for Pressure Gauges. Buy your Pressure Gauges now at www.reliablefluidsystems.com/collections/pressure-gauges. Stauff Pressure gauges are devices used to measure pressures in hydraulic systems and made in accordance to EN 837-1 European standards. It is applicable for hydraulic oil and gaseous media. The reading measurements are shown on the face of the gauge. Measuring pressure on equipment is essential for monitoring and providingthe smooth functioning and operating safety of the system. ​A pressure gauge has two parts, the casing and the connection point. Usually, the material for the casing is stainless steel (1.4301) and the material for the bottom or back connection is brass (Figure 1). The lenses are made of acrylic sight glass. The size of the casing is usually available in 63mm (2 1/2 Inches) and 100mm (4 Inches). There are two different connection directions, stem (bottom) mounting and panel (back) mounting. The connection direction is dependent on the system design. Connection wise, 1/4"BSPP & 1/4"NPT are usually used for gauges with size diameter 63mm, while 1/2"BSPP and 1/2"NPT are available for size diameter 100mm. (Figure 2). The gauges are available in different measuring ranges to suit different installation needs. There are two types of gauges are available; dry dial gauge (Figure 3) and glycerine filled gauge. Glycerine gauges reduce the effects of vibration and oscillation for needle reading accuracy. It also lubricates the movement and internal parts. In general, it improves reliability and extends the life of pressure gauges. ​Gauges are made to accurately read only the middle values. The accuracy range is ±1.6% of the full-scale for dial size 63mm, and ±1.0% of the full-scale for dial size 100mm. In order to make sure the readings on the gauge are accurate, a calibration test can be done by a laboratory. A certificate of calibration will be issued by a laboratory to confirm that the gauge accuracy. There are also many panel mounting options available for installation of gauges. The options include u-bolt assembly, front flange assembly, rear flange assembly and u-bolt with front flange assembly. Pressure gauges work well within a temperature range of -20°C to +60°C / -4°F to +140°F. Out of this temperature range, the gauge readings will be inaccurate. SHOP PRESSURE GAUGE COLLECTION HERE!